Now for my impressions of a recently shown edition of TOTP76. Who's presenting? David Hamilton apparently, a long-time BBC radio DJ I have strangely barely heard of. We start with The Kursaal Flyers' 'Little Does She Know' with its Spectorian cliches given a momentum that might best be described as a Southend-on-Sea chug. We are treated to some ridiculous marching-come-dancing from the front man, with his would-be Little Richard haircut and sanitised teddy-boy attire. This is followed by 'a song dedicated to the cash registers across Britain', as Hamilton puts it. 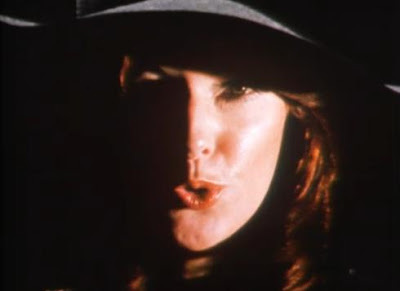 'Money Money Money' has never been my favourite Abba song but, in this context, it is a masterpiece. We are shown a typically Bergmanian video, with piercing lights, counterpointed figures and implied silences. Frida is in the shadows, imperiously Faustian beneath large black hat. perhaps something she had to . . . had to . . . tell . . . could that be it? Hamilton remarks of money: 'It does enable you to be miserable in comfort'. Interesting to consider in the light of the New Economics Foundation's 2004 report which claimed that 1976 was the year in which the British were happiest, after 31 years of relative social democracy. Now for the utter oddity of Jethro Tull's 'Bring Out These Solstice Bells'. 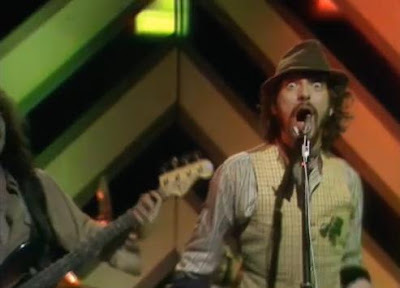 We are shown Ian Anderson leapfrogging, hand-clapping, leering maniacally like a cross between the pagan Green Man and Edward Thomas's English archetype 'Lob'. What a curious proposition this is: stuttering rock and folk song tropes colliding in a Christmas context. The gent striking the aforementioned bells looks if anything even more weirdly beaming than Anderson, dressed in a red scarf, black hat and sheepskin coat. "And now we have a treat for all those fellers out there", Hamilton announces. 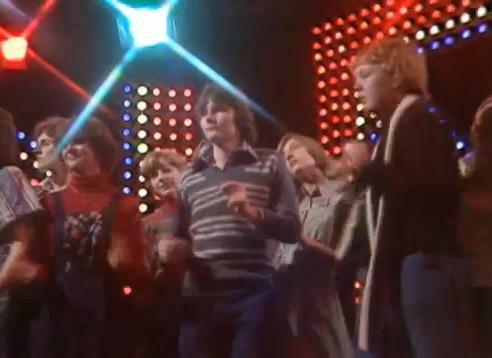 Legs and Co. dancing to Mike Oldfield's 'Portsmouth', a song featured in Alan Partridge's intended musical accompaniment to his newly published I, Partridge autobiography. A bare stage, a lone, artificial looking pine tree. A parrot (called 'Chalky', Hamilton informs us later). A sea chest. Six 'lovelies' dressed in antic Georgian (?) naval attire - feathered hats, frilly shirts, long boots and the like. It is so oddly unimaginable in any subsequent decade: a leisurely frolic about the place to an archaic, accordion and flute-led instrumental. Yet this was clearly pop of a sort. Many in the 1970s were intrigued by the past: while Oldfield and Legs & Co's 'Portsmouth' is no 'Jarrow Song', Upstairs, Downstairs, When the Boat Comes in or Penda's Fen it is symptomatic. One of them throws a load of coins at the screen to conclude this brief, bizarre interlude. Money, money, money. Next is Tommy Hunt with 'One Fine Morning'. This is really quite pleasant soul, if not really matching up to the more intense, ecstatic-melancholy of the best northern soul. This is followed by Hamilton briefly engaging members of 'the Northern Ireland Youth Peace Group' who are over from Belfast, having won a week in London. They do seem to enjoying their time away from the Troubles; we might regard the prospect of watching Dana as akin to medieval punishment but they seem delighted when she is announced. The erstwhile Eurovision winner of 1970 turns out a tedious, sub-Tina Charles plodder of a record in 'Fairytale' - inevitably accompanied by strangled fiddles and neutered guitars. I don't believe your fairy-tale, Ms. Independent, eurosceptic - and anti-abortion, divorce and contraception - MEP 1999-2004. A 'Season's Greetings' Christmas card fills the screen, is indeed zoomed into, as emerges the ghastly spectacle of Paul Nicholas's latest attempt to nullify 1976 pop. 'I brush my bowler and I grab my cane' the lyrics go and he actually has the bloody things. As he did in a previous atrocity; nothing special about 'Grandma's Party' then, which represents the deepening of a festering wound. Sub-Monty Python grannies in the background 'dancing', mugging - deserving a mugging. This is strained, soporific shite. 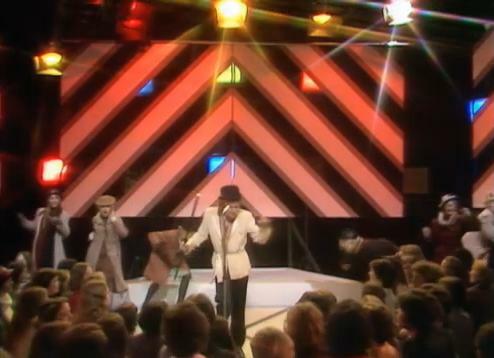 And you could have had Kevin Coyne on that stage - shame on you, British public. 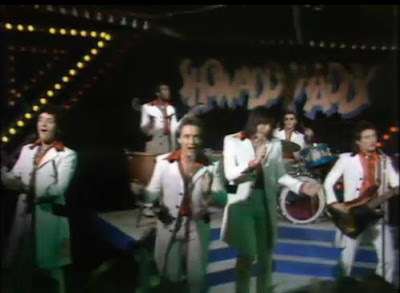 As if we haven't been spoiled enough, we are then presented with Showaddywaddy, a perpetual bane in this era of music. Revivalist 'rock and roll' would be more innocuous if this sort of stale retrospection hadn't afflicted us in its various guises in the thirty-five years since. 'Come on little darling take my hand!' could not sound more joyless if it was sung by Hughie Green at a National Association for Freedom shindig. The band sport matching suits, smugly shown in white and black mirror-image variants. A ghastly saxophone rears its head like a somnambulent battleaxe. This truly is music that people without spirit or shame lapped up for years; that stunted the development of school discos and laid the groundwork for musical dullards to prosper. Then we finally have a moment of unreconstructed sexism as Hamilton patronises a young lady: "This is a Fulham supporter, I thought I'd tell you that, that's why she's so good looking; that's right, isn't it?" She can only answer: "Yeah". To which Hamilton replies in his smarmy Bill Grundyeseque tones: "Yes, you're not too sure about that!" and "Give them a lovely Fulham smile then, go on!" This is why punk had to happen. There is focus on members of the audience dancing during the last number, Billy Ocean's 'Stop Me'. An audience of non-airbrushed ordinary people, mainly girls. A few really into it, most moving to an extent but one girl clutching a handbag barely dancing. The parrot present and correct. 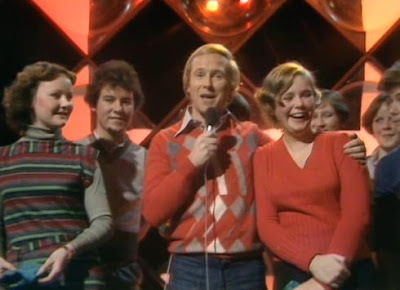 Jumpers, dungarees and scarves tell of an altogether less homogeneous dress sense than you might see today. The Ocean song slips by without eliciting any tangible response from me; so unremarkable and inoffensive one cannot take a position on it. It may be said to symbolise the era's longing after consensus and agreement. A consensus all the more elusive due to the hard-right insurgency of the NF, the NAFF and newly militant trade unionism. 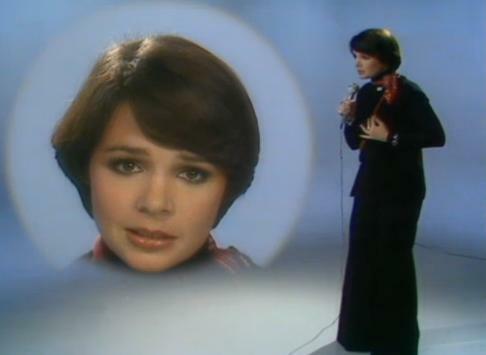 The font on the end credits is archetypal mid-70s with its yellow type; informal italics: Musical Director and staunch block capitals: JOHNNY PEARSON. Legs and Co. are apparently Gill, Lulu, Patti, Pauline, Rosemary, Sue - again, a 1970s set of names. This episode is indicative of the good and bad in TOTP1976: the conservatism of the era and also its relative openness compared with our own neo-liberal one. Abba, Jethro Tull, Mike Oldfield and Tommy Hunt are a persuasive sequence, indicating the era's greater openness to the different and the jarring. 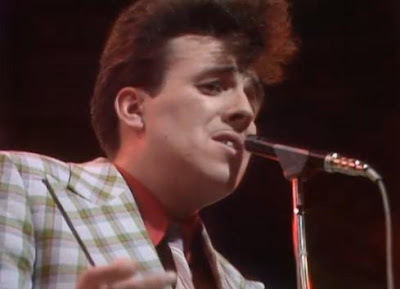 Yet, that is all only relative; Showaddywaddy are the number one and grinning buffoons like Nicholas represent the staid revivalism of the era. 1976 does not hold the bragging rights to pop cultural complacency, but the need for intelligence, vivacity and invention was rarely more acute than then. Thankfully for us all, music in the 1978-82 period delivered just the shock to the system that was required.